". . .people can come, and. . .talk to me . ..people who might just feel a little stuck. . .stuck, you know? And maybe they. . .just need a. . .another point of view on what's going on, if they're carrying, you know, a big burden, you know? Of some guilt maybe." — Ian, explaining what he does to the young man, Laurence who appears in one of the play's five scenes. All the characters in Conor McPherson's Shining City are in some way "stuck" at a critical point of their lives. They're all dislocated from their homes, but more importantly, from their emotional comfort zones. That includes Ian, the newly practicing therapist in whose Dublin office McPherson's 2004 play is set. Each of the play's five scenes is a duet between Ian and one of the other three characters. It's a sad and often funny group portrait of isolation, guilt and despair. Though more dressed up in its storytelling than McPherson's early plays, his knack for lyrical yet every day and very human speech patterns is on full display. And so is his penchant for ghosts. In this therapeutic setting the ghosts haunting both the therapist and his patient serve as an open sesame into their psyches. Since I saw Shining City twice before the current revival that marks the Irish Rep's return to its beautifully renovated home this is my third viewing. Though I knew what to expect, including the concluding twist, this is my favorite McPherson play; seeing different actors, especially in the key roles of Ian and John, kept me fully engaged during its 2008 Manhattan Theatre Club run and more recently at Barrington Stage in the Berkshires. And so it did this time. I was caught up once again in these people's lives. Ciarán O'Reilly's tautly directed production retains its rich Celtic flavor and seamless blends the script's humor and sadness. 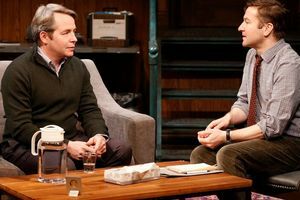 And of course there's Matthew Broderick in the play's showiest role as the recently widowed John, haunted by visions of the wife who was killed in an auto accident. It's Broderick's best performance in years. His brogue is authentic enough to make anyone who didn't know him as a die-hard New Yorker, believe that he'd spent most of his life in Dublin. (The busy dialect coach Stephen Gabis probably deserves his own round of applause). The play opens with Ian (Billy Carter, who manages to evoke strong chemistry in the three duets in all of which he's the second half) preparing for the arrival of his first patient. Broderick's John immediately makes you park any reservations that a man new to therapy and used to handling life's blows without falling apart, would so quickly open up. But so he does, even finding use for the box of tissues Ian has tactfully put on a table. If you're not instantly convinced, bear in mind that John realy is desperate. He hasn't slept in weeks. Both John but Ian have a lot of demons to lay to rest and. To bring the latter to the surface there's a scene with Ian's girl friend Nessa (a passionate Lisa Dwan) and a young homeless man named Laurence (a sensitive, understated performance by James Russell). You don't have to have seen the play before, as I did, to realize from the very first scene that John's distressed state began well before his wife's death and ghostly appearances. It's just as obvious that Broderick's stunningly delivered revelatory monologue will be mirrored in Ian's own unresolved insecurities — about having left the priesthood, commitment to Nessa and their child and his sexual identity. Complementary as John and Ian's stories are it's their different tonality that makes Shining City such a good play. While John's revelations have many comical elements, all played to the hilt by Broderick, Ian's problems are much more complex. This is borne out during his wrenching confrontation with Nessa who's with whom he's had a child but no longer wants to live. Ian's scene with Laurence is a more moving echo of John's much more amusing misadventures with women. With the renovation eliminating the old venue's awkward side seating section (this now houses two bathrooms and there's a 6-row balcony for the people formerly sitting there), Charlie Corcoran has a larger playing area for his design of the Dublin office. A short staircase leading to the top of the stairs visitors must climb after being buzzed in by Ian. Unlike previous productions I've seen, Mr. O'Reilly has smartly kept the business about people having to be buzzed in to a minimum. Early on Corcoran has given Ian's apartment a just-getting-settled feel with just what's needed to see his first patient. The between scene pauses show him making the place more comfortable and settled. These interim moments are enlivened by Ryan Rumery's incidental music and also reflected in the subsequent action. The rest of the design team adds to the aural and visual texture. It's great to have the invaluable Irish Rep back on its home turf. Check out the company's website to see the extensive renovation in progress. It includes images of the overall plan, the arrival of the comfortable new seats, an overview of the theater and part of the Shining City set: here. Tuesdays at 7pm; Wednesdays at 3pm and 8pm; Thursdays at 7pm; Fridays at 8pm; Saturdays at 3pm and 8pm; and Sundays at 3pm.